The American Medical Group Foundation and American Medical Group Association (AMGA) have produced a toolkit for medical groups participating in Measure Up/Pressure Down™. 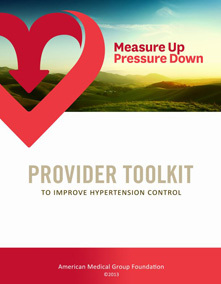 The Provider Toolkit addresses many common challenges associated with effectively treating and managing hypertension. The toolkit helps medical groups and health systems achieve 80 percent of hypertension patients in control, at goal, according to national standards (JNC 7). The comprehensive Provider Toolkit is available for download here. Individual sections of the Provider Toolkit are available below, organized by campaign plank. New tools since initial publication are posted below by date.